But Wataru Uekusa is a fantastic effects animator, so flames will suit him. A new batch of TV anime is coming to an end, and that means it’s time for brave last-ditch efforts by the staff to put together something impressive, as long as the industry’s cruel constraints allow for it… and even when they don’t, to be honest. The production of Scorching Ping Pong Girls only wrapped up around midnight last Friday, and despite having been forced to work with little resources and limiting motion throughout the series, they ended with a rather ambitious finale further elevated by an epilogue displaying nothing but spectacular animation. Some other shows cut it even closer, like the second season of Show By Rock which might as well have finished its animation the moment the last episode was going to air. And yet the show’s main animator Tomokatsu Nagasaku, who has done an inhuman amount of work for the series, found some final energy to animate a lowkey but expressive final performance. There are already multiple final struggles worth talking about, from Bungo Stray Dogs’ finale featuring the strongest animators linked to the series to Izetta’s last episode marking the end of Tetsuya Takeuchi’s production marathon. So instead, allow me to write about an indie artist who worked on a segment of an episode for a kids show that barely anyone outside Japan is aware exists. I swear we don’t intentionally shy away from titles that most western readers would be interested in, but I’ll risk alienating some potential readers to highlight interesting creators. Wataru Uekusa received his Masters in animation from Geidai in 2011, and that alone justifies some of his niche following; its pedigree as an animation school is as high as it gets, born from a combination of ambitious philosophy and proven success – a great part of its offspring has gone on to win prestigious awards after all. The focus of the program is the graduation project, which in Uekusa’s case was the music video やさしいマーチ-The Tender March-. Light on overt narrative and open to interpretation, the short film features a girl armed with her own memories fighting a monster born from the mind. Some of his staples are already present in his early work, particularly the striking yet never strident usage of color and superposition of textures. While not fully matured, you can also appreciate other preferences of his like the heavily stylized designs and effects animation as a core element. The FX in The Tender March is aqueous in its flow but often sharp-edged, and characters move in a rather bouncy fashion. Uekusa’s style is way more standard than some of his Geidai peers, but his clearly defined voice allowed him to quickly gain recognition; there is a je ne sais quoi to his work that makes it immediately attractive and pleasant, a high virality potential to all his pieces of animation which has undoubtedly benefited him. In that regard he reminds me of Ishida Hiroyasu of Studio Colorido, another indie darling who quickly climbed the ranks into the professional industry after gaining a big online following. Uekusa’s talents are particularly suited for music videos, so it should come as no surprise that those were the platform where he fully matured his aesthetic sense. Himitsu Spark and fake!fake!, both for the band カラスは真っ白/A crow is white, embody his evolution of an artist. Characters become even more rounded, and the FX animation is fully integrated into their beings. There’s a fascinating sense of cohesion in his work, even as everything frantically morphs you feel it belongs to the world he crafted. From this point onward, his work is unmistakable – and not due to a lack of desire to experiment, as fake!fake! already showed he was willing to partly drop his pleasant pastel tones to make chromatic changes into yet another one of his artistic weapons. It’s worth pointing out that as impressive as his work is in motion, it still retains its power in static form. His strong visual sense translates well into illustrations, which has given him plenty of outlets to further his career. Having caught the eyes of many fans, it’s understandable that the anime industry would try to seduce him. The attempts have been increasing in intensity as of late, with a point of inflection marked by the Punchline ending sequence that he storyboarded, directed, and partly animated. Far from a departure from his more independent work, that was another display of his beautiful, textured and colorful worlds. The amount of motion was more restrained that time around, to adapt to the tone expected of a closing sequence but also to the sad realities of the anime industry. That marked the tone of his most recent anime collaborations, which have a similar scope; his short ending for Aware! Meisaku-kun, and more importantly, his contribution to Folktales from Japan, which spawned this column to begin with. The show’s format fits him rather well; all episodes are divided into 3 smaller segments, and each part tends to prominently be the work of one artist. In this case, Uekusa did right about everything – from writing to fully animating it – except for the background art. It’s a sweet short story that once again makes up for its lack of rich motion with a very powerful aesthetic sense. And this isn’t to say there is no interesting snippets of animation, since even with restrictions he can’t stop himself from drawing beautiful FX that one again feel very cohesive. 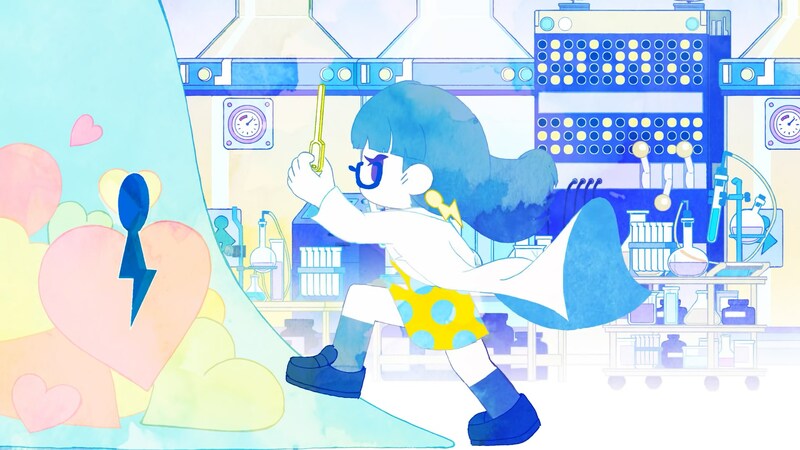 The world of animation is filled with struggles, whether it is within the harsh anime industry or the often overlooked indie space – or in cases like this, both. But there are also some reasons to be optimistic. The internet has created new avenues for artists, giving them the chance – but never the guarantee – that they can gain an audience by themselves. There actually are more Geidai graduates in the industry at the moment; Miyo Sato gained lots of recognition for her spectacular paint-on-glass animation for Mob Psycho 100, and even Toei Animation features some alumni amongst their ranks. But I feel like Wataru Uekusa embodies these new possibilities for animation better than most, so a look at his oeuvre was well deserved. And while it’s true that his output within the anime industry isn’t quite as impressive as his best work, I can’t help but dream of him leading a movie production. If we have any billionaire readers, you know how you could make me happy. I shouldn’t be able to get away with titles that don’t even include the name of the artist I’m going to talk about. Please yell at me. Which episode of Folktales from Japan is Uekasa’s work featured in? I’d love to see that. 245, last weekend’s. The first segment is his. Aside from the Uekusa pandering, thanks also for the shoutout to the Show by Rock ending sequence—I was afraid it had gone unnoticed, but it really was lovely. There genuinely was a bunch of very current material worth looking at, and liborek’s kept linking me Nagasaku’s nice work so I needed a shoutout at least. 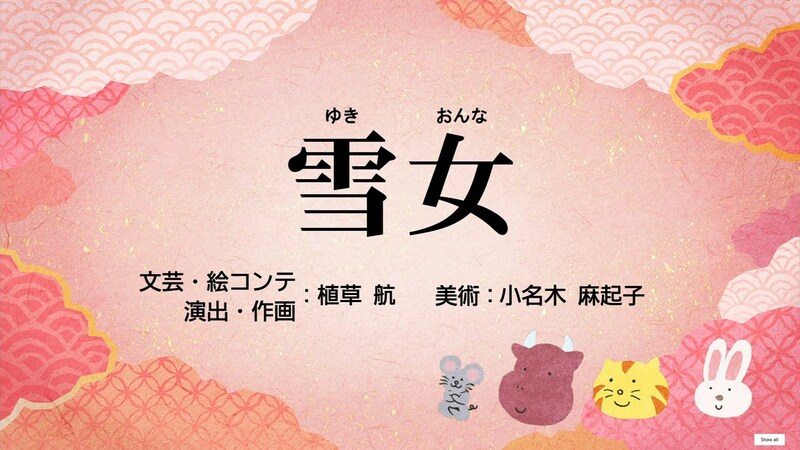 I’d love to see soon a similar opportunity for koya, who also was a darling of professor Mr. Yamamura at GEIDAI, on the animation production of a series or film (a step-up from his promo work; https://www.youtube.com/watch?v=9LtSw0r-2z4). I’d love that too, Koya owns. I’m not sure exactly what kind of magic Mob Psycho used to feature animation of not one but two cool Geidai people (though in different projects, to be fair). Also, I seriously hope someday Uekasa gets his own anime series with this art style. Maybe something a little Flip-Flappers-esque, who knows?